A comprehensive study by PricewaterhouseCoopers in 2006 laid bare the damage to our planet by the world-wide industrial revolution that began in Europe and the United States and continues expanding at this hour in China, India and Latin American nations in South America. The report suggested an overall estimated cost of $1 trillion to cap the greenhouse gasses that most scientists now agree is a major cause, if not the cause of global warming. The report also warns that the volume of these toxic gas emissions will double by 2050 unless rich countries agree to take “significant” policy steps to cut energy use. To the average guy on the street, a trillion dollar price tag is an incomprehensible figure. But in the contemporary world of big spending, when you consider that the United States deficit is rushing toward a figure of $9 trillion and the annual budget exceeds a trillion dollars, this is not an unreasonable amount to pay to stop a primary pollutant that is killing our planet and threatening our existence. Yet the politics behind this story also explains the great world dilemma that we all face. The United States, for example, which remains the primary polluter, has a political party in office that refuses to even participate in the Kyoto or Paris Protocols, which call for rolling back emissions and turning to green energy sources. The old argument against the Kyoto agreement was that the protocol put an unfair financial burden on U.S. industry. 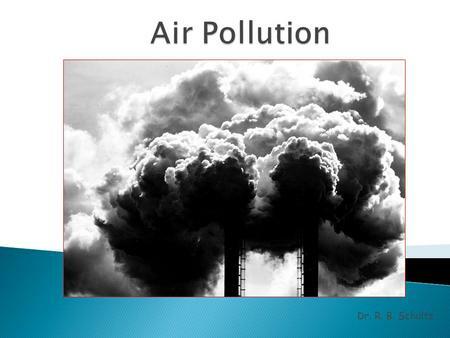 Industries in developing nations like China and Industry, countries were not required to adhere to Kyoto standards, and were allowed to avoid the cost of cleaning their stacks and auto emissions. They also enjoy the advantage of low-cost labor and thus can mass produce products for the world market at a lower cost that U.S. industry. The quest for money appears to be more important to big industry than seeking a solution to a problem that threatens the future of humanity. China is involved in an industrial building boom that is sucking up the world’s supplies of iron, concrete and other raw materials at such a rate that the cost of these materials has skyrocketed world wide. One report noted that at the rate China is growing, that nation alone will need a second Earth to meet its needs for natural resources within the next twenty years. Some analysts note that our world already is so overpopulated, and using up world resources at such a fast rate, that we already lack the basic commodities that include food, water and building materials to meet the needs of everybody. The danger in this is that this is a world of divided nations. Each nation is a people struggling to compete in a growing global market, and at the same time competing for a share of declining resources. And because of our carelessness, we have polluted our land, air and waters, thus making it harder to produce the food needed to feed us all, and find the amount of potable drinking water necessary to provide for everybody. Our forests are disappearing, our soil is falling to desertification, our weather is changing from moderate to extreme and our seas are dying. In spite of the continued warnings from the scientific world, notice that the two predominent political parties in the United States appear to be excluding the environmental and climate change issues on their platforms as they prepare for national conventions this month. The candidates rarely speak of it. The big question is: just who is going to finance and enforce such a cap, and how will all of the nations on the planet come to an agreement of such magnitude? The PwC report was presented to the G8 environment ministers during a closed-door meeting in Mexico in 2006. The Paris agreement has been reached and it is obvious that nations like China and perhaps India are making an effort to reduce emissions but this is hardly making a dent in the total picture. The prospects of this organization, representing only the selected major world industrialized countries, finding a workable solution are not very high. In fact, we have heard almost nothing more about this frightening report since it was made public. Getting every country to agree to such a plan, however, at a time when most nations are on the verge of going to war over religious differences, water rights and other dwindling resources, is not realistic. What is desperately needed is a radical change in thinking. What is disconcerting in all of this is that even the radical changes now occurring in world weather patterns, the severity of the storms and radical distribution of rainfall hasn't frightened people enough to take some kind of collective action to save themselves.